Join us for a discussion led by Dr. Justin Pope and hosted by Student Diversity Initiatives! We will explore the words 'Native American' and 'American Indian', both racial terms contested by indigenous people in the United States. 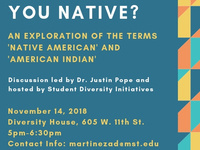 The talk will be held on Nov. 14th in the Diversity House from 5pm-6:30pm. Dinner provided!